Thistle Bonding Coat is a gypsum undercoat plaster for use on low-suction backgrounds, e.g. some brickwork, block work or concrete, Gyproc plasterboard, expanded metal lath, or surfaces treated with bonding agent. With a final coat of Thistle Multi Finish, Thistle Bonding Coat provides a smooth, inert, high quality surface to internal walls and ceilings, and a durable base for the application of decorative finishes. 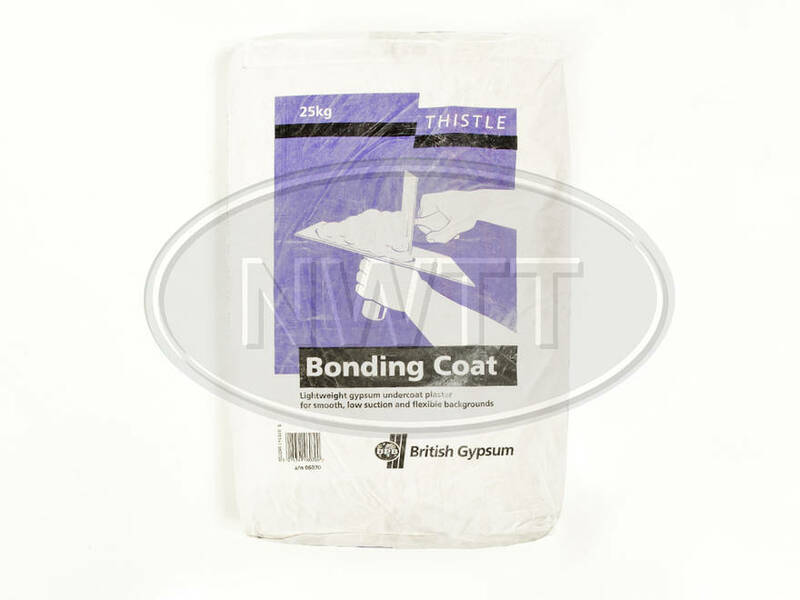 Thistle Bonding Coat is a lightweight, retarded hemihydrates, pre-mixed gypsum plaster, incorporating exfoliated vermiculite aggregate, requiring only the addition of clean water to prepare it for use. Each bag covers approximately 2.75mtr2 x 11mm thick, with a setting time of 1.5 / 2 hours. If you require further information on our Bonding give sales a call on 01942 720777 or email us on sales@nwtt.co.uk.